I always hear the phrase, "write what you know." My reaction has typically been who the hell would want to read a fantasy novel about bodybuilding, basketball, or energy policy? Of course the answer is - my mom. Thankfully for me, and everyone else who will have the pleasure of reading The Whitefire Crossing, Courtney Schafer's knowledge of mountaineering has a much broader appeal. When I received my advanced copy of Whitefire, I took a minute to read about the author's background. As it turns out she's an avid rock climber with years of experience. She even has a picture of herself inverted on her "About" page on her website. I always find it difficult to walk the line between writing what I know and committing mental masturbation. Look how much I know about this! In a surprising development (notice the sarcasm here) Schafer is a better writer than I am. While she may have shared my same concerns, she shouldn't have. Every second spent on rock climbing or related activities in Whitefire is a breath of fresh air. Her enthusiasm bleeds through the page infusing her main character Dev with vigor and life that couldn't have been accomplished any other way. It's clear that when Schafer put fingers to keys she was excited to write this story. This passion sustains the novel in its early stages and provides the momentum that carries it to a great conclusion. Schafer's main character Dev is an outrider for a merchant caravan with a penchant for scaling difficult mountain sides. He's also a part time smuggler who gets talked into bringing the mage Kiran across the border that divides two nations with diametrically opposed viewpoints on the legality of magic. Kiran ends up posing as Dev's apprentice which provides Schafer adequate opportunities to wax about talus, pinions, scree, and a host of other climbing nuances. Once Dev and Kiran get out of the mountains, the story is only half done. Schafer proves that she's not a one trick pony immediately delving into a far more gritty and urban setting. While some of the urban world felt flat in comparison to the lushness of the mountains, by the novels conclusion it starts to reveal itself in more depth opening up a host of avenues for future installments in the series. I always find that when reading a review, one of the things I want to know about is point of view and how the novel handles it. In this case, Whitefire is written with two different narrative perspectives. Dev is given the first person treatment where Kiran's point of view is from the third person. If I’m being honest, I really struggled at times from the switching points of view. When I read my eyes train themselves on where to focus in sentences for pertinent information and when the switch occurs in point of view from first to third these information cues switch too. Ultimately, it was a small annoyance (and possibly exclusive only to me and the way I read) and given the inherent bias in a first person narrative getting an additional point of view was refreshing. Equally refreshing was Schafer's decision to write two male protagonists. Every female fantasy reader is now saying - ugh, all fantasy books have male protagonists! And they'd be right. But not all male protagonists are written by women - in fact, very few are. The only thing rarer is male writers writing female protagonists. I can only hope that more male authors look to Schafer's cross gender example and attempt to write stronger women. There's no doubt a few male fantasy authors could use to imagine being in woman's shoes a little more and in their undergarments a little less. Whitefire is one of the best novels I've read in 2011 (out of 38 so far, but who's counting?). What starts off as an adventure novel of rock climbing and trekking quickly turns into a full blown fantasy romp full of magic, ne'er-do-wells, and flawed heroes. I'm always nervous when I recommend a book this highly, especially when it doesn't do something that's going to change the genre. But what can I say? Schafer's debut novel totally charmed me and I can't wait to read her sequel, The Tainted City, due out late next year. 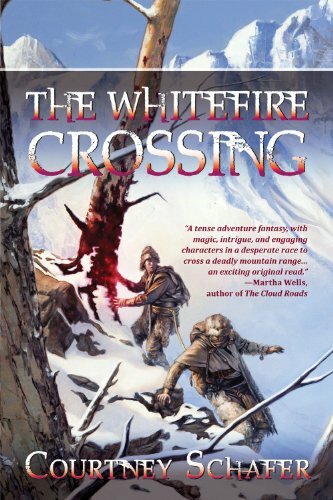 The Whitefire Crossing will be available in stores on August 16.